It was Samuel Bates and Susanna Phillips Briggs that launched the first congregation of the Churches of Christ in Douglas County in 1852. They had crossed the plains from Iowa the summer before with their daughter and son-in-law Cornelius and Sephronia Hills. Cornelius had been the Wagon Master for the emigrant train. About 1853 they were joined by William and Mary Ann Preston. William had come overland that summer. The church grew as more and more people responded to the call of being Christians only. They reported 30 members in 1871. In 1889 A.B. Wade reported in the Christian Standard (March issue) that he "organized" the church. In the church lingo of the time, that may have meant that he appointed elders and deacons. The community was named for its first settler, Dr. James Cole, who established his home in 1851. E. G. Browning (-1888) was the minister of this congregation that was established in 1854. Historian "Pop" Swander mentions the congregation. They reported 11 members in 1871. Dr. Browning is discussed below in the Myrtle Creek entry. This central Oregon community is just off Interstate 5 approximately 15 miles south of Roseburg. It was named Myrtle Creek because of the groves of Oregon Myrtle in the vicinity. Myrtle Creek church was established originally in 1855. This was very early in the life of the community. The post office had been established only the year before. Dr. Edmund Green Browning (-1888), pioneer minister and physician, preached each third Sunday of the month in a school building located on the site of the present City Hall. Browning's wife Nancy Callison Browning had died on the Oregon Trail in 1852. He then married Nancy Allen in 1853. Dr. Browning had five children by his first wife and ten more by Nancy Allen. Another charter family at Myrtle Creek was Alpheus (-1868) and Sopia Ireland (-1887) from Indiana. Both the Brownings and the Irelands are buried side-by-side on a high hill next to Interstate 5 in Myrtle Creek. A few of us have associated ourselves together here as a congregation, upon the Bible along, but have not yet chosen our officers. We generally meet every Lord's day, and worship God the best we can. At first we numbered only about ten; but we now number some twenty. We were much edified and encouraged recently by a visit by some of our brethren from the North. The church reported 17 members in 1871. 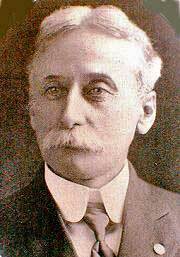 One of those was probably John Burris Smith, one of the founders of "Monmouth University," known today as Western Oregon University. John had moved to Myrtle Creek following the death of his wife Emily in the mid-sixties at Monmouth. The Smiths had entered Oregon from the south on the Applegate Trail and so would have passed this way in 1846. John was 30 and Emily was 22 that year. He was the fourth gospel preacher to enter the new land of Oregon. Smith preached in Douglas County the remaining days of his life and is buried at Myrtle Creek. There is a profile of John Burris Smith. He is the great grandfather of Barbara Reyman of Reno, Nevada. The church's own record book shows they reorganized in 1875, "members agreeing to take the Bible alone for their rule of faith and practice." The record book was in the possession of Marion and Doris McKee. The names were written in an old style cursive script. The capital letters were hard to distinguish and we may not be right in every case. We have paired husbands with wives where we had supporting information. They were not originally listed that way. We have also provided names instead of initials. John Adams, Mary J. Ady, Sarah A. Brown, Edmund Green & Nancy Browning, Julia Browning, Olive Browning, Sarah J. Bruce, Catharine Carson, Lavina Cornilison, Sarah Cornilison, Amanda Cowener, Susan Dunivan, Lonisa Gabbert, T. M. Gabbert, Sallie Hays, W. J. Hays, L. C. Hill, Sophia Ireland, Hallie Jones, J. B. Lewis, Carrie Mulkey, Isaac Newton & Julia Muncy, Julia A. Neany, James G. Newton, L. D. Phillips, Nancy L. Phillips, Lavina Rafile, Harriet Richardson, Margaret Richardson, Mary Richardson, Mrs. Ellen Richardson, John Burris Smith, Mary E. Stevens, Dillard and Melissa Smith Strode, Anna Weaver, William Weaver, M. S. Whitsett, Mrs. Elizabeth Whitsett, Henrietta Wiley, and Cora Willets. A report in the Christian Standard of 1885 records yet another reorganization. For a number of years past there has been a few of our brethren in this community, but with no pastor or organization; becoming tired in that way, they invited me to come and hold a meeting for them. I accepted, and after a journey of about eight miles, commenced services, Saturday, May 15th, and on Monday following it was decided to organize a congregation and employ a preacher, after which the brethren held out sufficient inducements to me to come and settle among them and preach for them. We now have twenty-one members and a good interest in the people, and seem to be on the high road to success. We have also Lord's day school which is a power for good in our midst, and a live Thursday evening prayer-meeting. All are at work with a will for the cause of the Master. Pray for us. -- O. C. Huntington. Note: Huntington family researcher Harlene Soper Brown believes this is a reference to Cory Ozi Huntington who lived in the area and died at Dexter, Oregon in 1941. He would have been about 23 at the time of writing. We speculate that the initials were reversed by the typesetter at the Christian Standard because the communication was handwritten. (C and O would look similar.) Errors in personal and city names were very common at the Standard because the person setting type did not know the person or place and could not verify a spelling. Another possibility is provided by Julie Kidd. She believes that "O. C. Huntington" is Ozie Curtis Huntington, born in 1829. He lived in the west and shows on the 1900 census for Pe Ell, Washington. See notes on the previous list. Mary J. Ady, Elizabeth Alexander, R. R. Alexander, David R. Boyles Catherine Carson, Sarah J. Cornelison, G. W. Holloway, R. A. Holloway, James M. and Bell G. Hudson, William & Catherine Manning, Caroline Miles, John Miles, William H. Miles, Carrie Mulkey, James & Phebe Newton, John Burris Smith, L. G. Stewart, Dillard and Melissa Smith Strode, Sarah J. Tallin, David Tate, Mary A. Tate, Eliza A. Wiley, Henrietta Wiley, Isaac Wiley, Thomas Wiley, and William M. Wiley. Evidently startup of 1885 also faltered, because on the next page of the same hand-written record book the same organizational statement is repeated, but with a new date of 1888, showing there was a continuity of the same people because they had the same book. (In fact, the same handwriting records both pages, i.e, 1875 and 1888. The 1885 effort is not mentioned.) William Manning became the leader of the church. The church was reorganized with 30 members. William Wiley, one of the charter members, provided leadership and carpentry skills and a building was constructed with mostly volunteer labor. It was completed in 1890 and dedicated by Evangelist A.B. Wade. In the first year of the new building, there were 24 added to the body. Another page in the record book shows a special congregational meeting being called. "Object of meeting stated to be to adopt the best means of evangelizing Douglas Co. Oreg." A. B. Wade, recently from Wichita, Kansas, was the chairman of the meeting. Under Wade's leadership the church had high goals. Every church has the responsibility to evangelize its area. 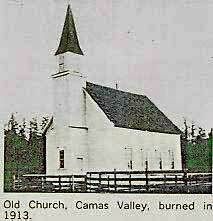 The church was incorporated with the State of Oregon on March 22, 1889 by Thomas Wiley, G.W. Brewer and Jos. Cornelison. This small Disciples congregation remains to the present. Several of these pioneers are buried in the pioneer cemetery on a hilltop near I-5. Their names and instructions for reaching the cemetery are on this link. One of the earliest preachers here was the untiring A. L. Todd. See the separate profile on this remarkable pioneer preacher of gospel. The profile of Abbott Levi Todd. One of Thomas Crawford McBride's descendents, through Dr. Thomas McBride, settled here. Lelia Ethel Bounds and her husband, Lawrence Leslie Childers were active members of the congregation for many years. One source records a party given in honor of Mrs. Susie Dailey as she retired from 72 years of service in playing the piano and teaching Sunday School. Her record sets a great example for others. Two independent congregations in Myrtle Creek merged happily in 1995. Significantly, the church on Division Street was invited to merge with the Myrtle Creek Church of Christ that meets on the Pacific Highway. This congregation was originally established by Mel Coffman. Winchester was probably named for explorer John Winchester. It was the Douglas County seat until the offices were moved south a few miles to Roseburg in 1854. Historian Swander lists the church as beginning here in 1856. Dr. Samuel D. Evans (overland in 1852) was leading a congregation before he and Louisa moved to Virginia City, Nevada in 1859. This settlement was (and is) seven miles west of Sutherlin on the Fort McKay Road. It is also two miles east of Coles Valley. In September of 1869, John M. Harris conducted a protacted meeting there and reported 14 additions. Evidently there was a functioning church there to have called Harris and to be a nucleus for the growth. A.L Todd wrote in 1870 that he immersed four who made the good confession at Oakland. By 1871 the group reported 22 members to the Christian Messenger. Historian Orval Peterson tells that in 1882 Edward and Annie Chase moved to Camas Prairie (Idaho) from Oakland, Oregon. Mr. Chase was an ordained minister and began preaching immediately when he arrived in Idaho. The Chases were pioneers of the 1860s. Also, Michael and Margaret Shupe, pioneers of 1853, were members here. A.L. Todd preached here in his circuit riding days and these ended in 1880. Charles Augustus Sehlbrede, a resident of Roseburg, had his law office in Oakland in 1885. He is listed as the City Recorder in 1886 and was the "correspondent" of the church in Oakland in 1887 according to the Disciples of Christ Yearbook. At that time, a membership of 46 was reported. Mr. Sehlbrede later launched a congregation in his Roseburg home. See the Roseburg entry. The Oakland congregation claims 1888 as their beginning date. Check their own page for more details. The group was incorporated with the State of Oregon on March 22, 1889 by T.O. Hutchinson, J.H. Ray and John H. Shupe. 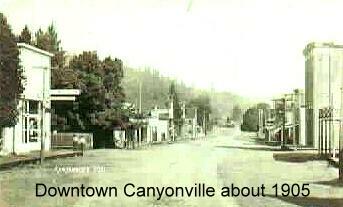 This community has vanished, but was about five miles east of Oakland, Oregon. They reported 26 members in 1871. By request I write you and account of a protracted meeting held by the Church of Christ at Camas Swale. Bro. J. M. Harris of Lane county, came over and labored with us ten days, beginning on Friday before the second Lord's day in this month (May). Bro. Harris presents the ancient Gospel in a plain and forcible manner, which defies contradiction. We met on Monday, the 14th and effected an organization with 24 names on the list. Good feelings prevailed throughout the meeting. We think that much good has been accomplished. The good seed of the Kingdom has been sown, and we trust that it has fallen on good ground where it may bring forth fruit to be gathered in due season. Bro. Harris has engaged to preach for us one year, occupying every second Lord's day. He has now gone to Coquille City to hold a meeting. J. M. Harris died in 1881 and is buried in the Taylor-Lane Cemetery near Cottage Grove, Oregon. 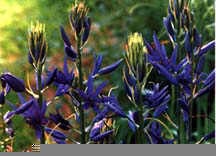 Named after the beautiful blue Camas flowers, those men who originally discovered the area looked on the Camas in bloom from a distance and thought they had discovered a lake. The community had settlers and religious services as early as 1848. The first religious services were held at log cabin homes, out of doors in good weather, and later at the valley's primitive early school houses. Lay volunteers led in reading passages of Scripture, the singing of hymns and offering prayers for Divine Guidance. The first organized congregation of any kind dates to the 1880's under the leadership of William Allen. Mr. Allen baptized those becoming Christians in the chilly waters of the Coquille River "and inspired the building of a church." The small white structure, with a steep roof, belfry and steeple, was built on the West Side Road near the intersection of Upper Camas Road. The congregation eventually became a Methodist Church and the building burned in 1913. The town was named by its most famous postmaster, Jesse Applegate. The three Applegate brothers were personal friends of Abraham Lincoln from their days in school together. While the current congregation at Yoncalla has its roots in this century, there was a church here in the 1870s. They reported 19 members in 1871. E. A. Chase preached here once each month and the church met in the Scotts Valley school house. John Moses Harris held a gospel meeting at Yoncalla in 1870 with eight being added to the church. Members included William Hunt Wilson and Hannah Dickinson Wilson. He was an overland pioneers of 1843 while Hannah came in 1847. They were married in Oregon. By 1878 there were two church groups. One continued east of town at Scotts Valley and the other met at the home of William Wilson. They may have also used the Yoncalla school house at times. W. H. Wilson had formed a fast friendship with Kentuckian Jesse Applegate and had come overland with the Applegate wagon train. Settling near Yoncalla was a natural choice. Hannah was a very young widow when she married William Hunt Wilson. They were baptized in a stream at Yoncalla by Glen Owen Burnett. The Wilsons had 10 children, farmed and he served in the Territorial Legislature. In his declining years pioneer preacher Daniel Elledge lived in their home and died in Yoncalla in 1894. The Wilsons are buried side-by-side in the Yoncalla Pioneer Burt Cemetery. Hannah died in 1919. 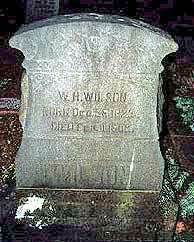 Buried in the Wilson family plot is a runaway slave, William Edes (or Eades). Mr. Edes had served in the 1846 Mexican War before making his way west and eventually settling at Yoncalla. Daniel Elledge is the subject of a separate profile. The descendants of William and Hannah Wilson held a reunion in Drain during August of 1997. Many still keep in touch. A family historian is Christy M. Van Heukelem. Your browseers does not support the video tag. The earliest known date for this Christian Church is 1876. The first members rode over from the Kellogg area to particpate in the services. It was necessary to cross the Umqua River twice on ferries to reach Elkton. N. B. Alley reported in 1890 that H. E. Jones had 10 additions in his last meeting at Elkton. The church was active at that time. The group was incorporated with the State of Oregon on November 19, 1890 by A.J. Huddleston, H.G. Brown and J.J. Hinderer. The Elkton church closed after some years, then the building burned. The church was restarted in the 1920s and is now very much a part of the community. Days Creek was named for local settlers Patrick and George Day. It is located near the headwaters of the South Umpqua River. Among the church members meeting in this mountain town in 1877 were J.R. Jenning, William and Elizabeth Briggs (1851 & 1853), Andrew McCabe, John C. and Cinderella Smith Harris (1851 & 1846), and Dillard and Melissa Smith Strode (She:1846). McCabe and Strode became elders in the church. The Smith ladies were daughters of John Burris Smith of Myrtle Creek. William Fernando Briggs was Douglas County Surveyor and deputy United States Mineral Surveyor during his days at Days Creek. He and his wife are buried at Canyonville. E. A. Chase wrote in May of 1877 that he had been preaching for the church one time each month, but was going to stop making the trip from Oakland, Oregon due to his need to return to manual labor to pay some medical indebtedness. The church numbered 15. The town is named for pioneer settler Charles Drain, its post office being established in 1872. The congregation dates from August of 1878 when ". . . a small group of Christians decided they wanted to worship according to the New Testament pattern, having no book but the Bible and so their children might have a church home." So reads a statement released by the Drain Church of Christ. One of the organizers of the church was Charles W. M. Smith, pioneer of 1872 from Indiana. The Smiths lived on Bell Mountain, west of Drain. He had organized seven churches before coming west. Among the earliest members at Drain was James Harlan, another pioneer of the 1870s. The first minister was Thomas McBride Morgan. His parents' loyalties can be seen in the name they picked for their baby son. 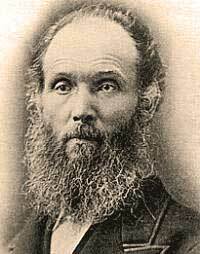 Thomas C. McBride was a very early Restoration preacher, a friend of John Mulkey, and an Oregon Pioneer. T. M. Morgan had moved to Bethel in Polk County by 1880 where he preached in four congregations. There is a profile for Thomas Crawford McBride and one for Thomas McBride Morgan. Drain, Dec. 16. -- As an item of good news I will say that we have been having some very interesting meetings of late, thirteen in all having been added within the last two months. We closed a meeting of ten days the 10th of December with 6 additions as the immediate results -- 2 took membership, 1 from the Methodists, 1 reclaimed, and 2 by confession and baptism. Bro. R. G. Collison (Callison) was with us and did the preaching. We commend him for the good work he did while here. The meeting was a success in all respects, being well attended from the first to last, with good attention. Mr. Shelley left Drain at the end of 1891, moving to Independence, Oregon. David C. Kellums replaced him immediately. In fact, there was a revival meeting in progress and Shelley preached the first part and Kellums completed it. It is possible that Ephraim Badger was the minister from 1894 - 1898. He and Tavie were living here while their girls attended the old Central Normal School at Drain. Tavie is a great-granddaughter of Thomas Crawford McBride. There is a profile of Ephraim Badger. A photo of the Normal School is mounted on the Internet. The minister about 1905 was Billy Moore, shown with his wife Dian. "At first the little congregation worshipped in the skating rink on the site of the bank building and later in the old school house just south of the church's present location. Plans were made for a building and W.H. Wilson gave 50 bushels of wheat which was sold to the Drain brothers and the money given to the building fund.... One of the original stones dating to 1883 is incorporated in the present foundation and is visible in the basement." 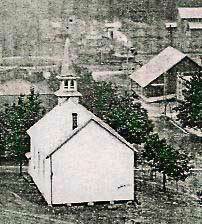 In the photo at right, the building peeking from behind the trees at the far right is the Town Hall with the jail and firehose building attached. The building shown here is still the central part of the much-expanded present building. It can be clearly seen from a back view. The steeple has been incorporated into the expanded building. First known as Deer Creek, this community is at the junction of Deer Creek and the Umpqua River. The congregation reported as the Deer Creek church in 1871 with 12 members. The congregation later met in the home of Charles Augustus and Ianthe Downing Sehlbrede. The year was 1889. C. A. Sehlbrede (-1922) came overland from Indiana in 1877, was admitted to the Oregon Bar in 1878 and served in the Oregon House of Representatives until President McKinley appointed him as U.S. Commissioner at Skagway, Alaska. Later he returned to Oregon to again practice law. C. A. Sehlbrede's name can be found on the list of those in Alaska during the Alaska-Yukon Gold Rush. There is a profile of C. A. Sehlbrede. 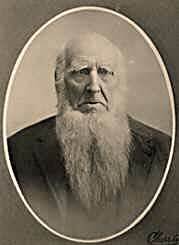 Among the old-time preachers in Roseburg was Thomas McBride Morgan, pioneer of 1875. In 1890, the circuit-riding preacher was A. D. Skaggs, recently emigrated from Kansas. He divided his time with the Pleasant Hill Church. The church was able to dedicate their building November 29, 1891. It was located at the southeast corner of SE Pine and SE Woodward Avenue. 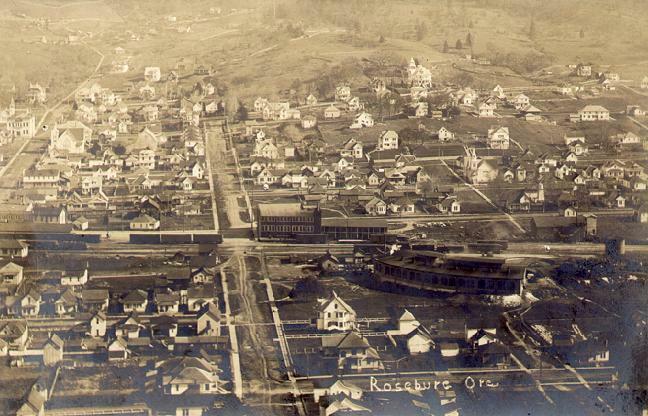 It can be seen in the photo of Roseburg. 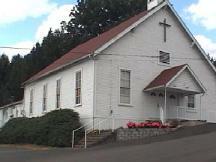 There is a photo of Roseburg that contains the photo of the Christian Church. The list of out-of-town guests reads like a Who's Who of effective Oregon preachers. David C. Kellems, Rolander L. Shelley from Independence, David Wetzel from Portland, James F. Stewart from Albany, Ebenezer B. McElroy as Oregon Superintendent of Public Instruction, Levi Lindsay Rowland, A. B. Wade from Hillsboro and E. R. Williams from Salem. C. A. Sehlbrede had headed the building committee. The new building was put to immediate use with a gospel meeting by A. D. Skaggs. Roseburg, Dec. 2.-- On the 12th of November my three children made the good confession, and on the 13th were buried with Christ in baptism by Bro. Kellarney. On the 16th Mrs. H. R. Johnson, wife of Eld. H. B. Johnson, was immersed by your humble servant. She is 81 years old. In 1904 George C. Ritchey was the minister. 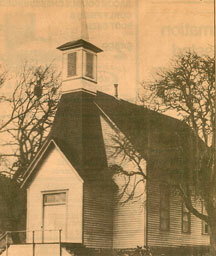 About 1900, a congregation met in the school house at Kellogg, south of Elkton on Highway 138. Services were conducted by John H. Mulkey, principal of the Elkton public school. John made the trip with his wife in a farm wagon. The Mulkeys normally arrived Saturday evening and stayed at the home of Mrs. Mary Ann Minter. Two services were held on Sundays separated by a basket dinner under the large maple trees.